I’m sure you’ve noticed winter is coming but it’s more than just a tagline from a popular show. It’s the truth. Especially here in the north, we have noticed that it’s getting colder and you’re seeing some performance issues with your gear so I decided to share 10 helpful tips for playing paintball in Winter. Hopefully, after knowing these winter paintball tips you’ll be able to get through some of the difficulties and you guys will enjoy paintball in winter. Winter is a tricky time to play paintball but it’s not impossible. What you notice is a lot of ball breakage, your marker isn’t always as responsive as it should be and you see general performance issues with paintball gears and you get tired early in winters. 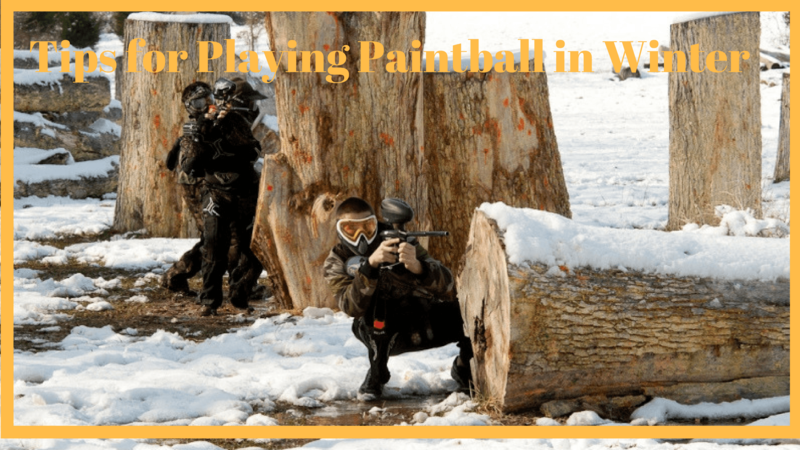 These all happen due to cold weather and here I’ll help you to tackle all these difficulties with these 10 Winter Paintball Tips. So, without wasting any more time let’s jump into it. Now electronic paintball guns obviously are gonna slow down because electricity doesn’t flow well in the cold. It’s just the nature of electrons. So you need to do is make sure that you are using a high powered battery. Also, do not use old batteries as they won’t be much effective in cold weather. Try to use fresh high powered batteries. Also, it is possible to actually switch the solenoid to high power. You’ll find that in your menu tree under the hardware switch. So, when they are at high power, that’ll give the solenoid a little bit of extra push to help force it through that stickiness from the cold. It’s unfortunate but the cold is not kind to spool valves so if you have DMS, Geo’s, rails you’re not gonna see the very best performance from them because they rely heavily on air expansion and air does not expand as well in the cold so you’re should stick with more of the poppet type. If you have to use an electronic marker you’re should stick with Etek. These are good markers to run with. Simple spring return guns are good choices as well so your minis and your axes should also perform pretty well. Again with your high-end guns like vanquishes, DMS and Geo’s you’re not going to see the best performance out of them. A good idea for playing in the winter is to keep it simple this is why a lot of people have backups that are incredibly basic markers like your zones you’ve 90885 or your mech markers like a resurrection or even a pump gun. You’re not going to see a huge drop in performance. It’s not like the temperature is below zero degrees, therefore, the gun doesn’t work but you will notice little performance issues from your marker like the eyes aren’t always as responsive as they should be. They might take a couple of extra milliseconds to detect a ball in the chamber. It may not always fire immediately when you pull the trigger just because electrons flow more slowly at low temperatures. For Hoppers, you want to look for one that’s going to be gentle on paint. Now that could be hard to find in a tournament hopper so you want to take care to check and see what kind of paddles it has, what sort of performance is gonna happen. Again this is sort of a common theme with playing in the wintertime is that you want to keep things simple. The dye rotor is very simple and very reliable however the parts in it are not the softest. You see the potential for more breakage there, however, I can always guarantee the rotor will work the longest of any electronic hopper. Spiders are a good one as well they have a soft paddle in them and also the internal chamber reservoir for the paint doesn’t have a lot of obstructions for the paint to get caught on or get broken. I feel spiders are the best choice as a winter paintball hopper. They’re very smooth running hopper and they’ll perform quite well for in low temperatures and again in your hoppers, you want to make sure you’re using good batteries for better current flow. Regardless of what hopper you take or what steps you take, it is very important to make sure that you use good quality winter paintballs so that it performs well in the wintertime. You do need to have good winter paint in it. Personally, my favorite is GI frostbite and I suggest you give that a try this winter for your best performance. In the cold CO2 tanks is not a good idea. CO2 is a liquid- gas that you count on to expand into an airborne gas which would not do very well at low temperatures. What you’re gonna find out is a lot of the liquid gas just freely flowing through your gun, dense white vapors coming out of the gun and that would cause a lot of problems. The issue can be solved by using compressed gas (HPA) tanks. The temperature doesn’t affect the expansion of HPA hence, HPA tanks would work fine in Cold weather. If you can only use CO2 tanks what you want to do is avoid hot fill. That’s when you fill too fast because if you notice when you fill a tank really quickly it gets warm and in the winter your tank is typically gonna be cold already and so if you try to quickly introduce heat to that you’ll see blown burst discs because they’re little copper plates. So, you definitely want to take your time. Slow fill on those and avoid rapidly discharging and then refilling. Give your tank a few minutes to sort of adjust to the ambient temperature if it rapidly purges. Also, do not shoot quickly with CO2 tanks. As you know CO2 takes a longer time to expand in cold temperatures so, wait for a little after you take a few shots. This is the most important tip among all. Dressing up with warm clothes in layers for winter paintball is very necessary. I have seen a lot of players who come to play dressing like a normal summer day and end up getting caught by the cold and ruin their day. So, here I’ll give you the list you should definitely wear for playing paintball in cold weather. Always wear under armors, sweatshirts and waterproof jackets. Vest to protect your chest and keep it warm. Wear Face wrap or shemagh. Wear thermal under your paintball pants. A beanie or warm cap. Regardless of what kind of mask you have especially when it’s cold out there’s gonna be all kinds of condensation while exhaling and breathing. While you’re playing so I’d recommend getting some virtue glint spray. This stuff is great it helps to protect your lens but it also puts a nice protective anti-fog layer on there so it will keep your lenses clean to see clearly. It can keep you in the game much longer and be a much bigger threat to the other team. Another important thing you can do with any of the electronic guns is to make sure that you are not using too much lube on your drivetrain. So, especially in the winter is the oils and greases can bind up and thicken up a lot more when it’s cold up which is going to cause issues like poor cycling and stuff like that. Basically, things that are not going to function the way that it should. So take care of it if you want your gun to work fine at low temperatures. The final tip is to clean the gun more often. Get all the old lube, the grease or oil whatever it may be and get new fresh stuff on there. Make sure you use a lot less than you normally would. Essentially what you want to do is to make sure there is no grease on o-rings and clean your drivetrain carefully. So these are the 10 tips that I have for you so you can even enjoy paintball in the wintertime. Just remember these tips, stay warm and enjoy. If you have any questions or any suggestion feel free to comment down in the comment box. I’ll try to answer all of them.